Regardless of the rain and small turnout, the Run Mag Mile was a long overdue homecoming. Wouldn’t call it a comeback, she’s been here for years. For race pictures, contact us. Ever since I was a child, I had chronic headaches. My mom wouldn’t let me run track because she thought it would make them worse. I finally convinced her by the 8th grade and joined the track team. Being fast came as a surprise and I quickly fell in love with running. At the time I would run something like a hundred meters, the idea of running more than a mile seemed crazy. I ran throughout high school and tore a hamstring my senior year. Towards the end of college, I picked it back up as a long distance runner. What got you back into it? I started college as a dance major, but the hamstring stopped that from being a possibility. So I had two years where I had no physical activity and really missed it. I decided to start running again and slowly fell in love with long distance running. Did you have a family member or friend that planted the seed to join track? No, I was the kind of kid that signed up for anything that was remotely interesting. At the time, the girl’s high school track team was very good and the coach was awesome. It was a natural progression. Was your first marathon a half or a full? Full. The Run Mag Mile was my first half. What made you decide to start with a full? I had this idea that if you start small, the bigger things will seem daunting. If you’re not a runner and you start with a half, doubling that distance can be overwhelming. My idea was to start big! I thought that if I could run a marathon a half marathon would feel like a training run. No big deal. I could wake up tomorrow and run a half marathon. That strangely makes sense! What was it like running your first marathon? I’m one of those people who seriously believes in endorphins. I don’t do drugs but endorphins are where it’s at! It hit that sweet spot between being super tired and energized at the same time. Did you have a goal in mind? Everyone says your goal for your first marathon should be to finish. That wasn’t a concern for me, I knew I wanted to run a marathon and knew I would finish. My goal was to be somewhat speedy, but I didn’t quite yet know what that meant. I think my time was 4 hours and 17 minutes, which is a decent time for a first time runner. I finished better than I thought. Did you run into the wall? People always talk about the wall. I’ve never experienced the wall. [laughing] All I ever run into is the wall. What are endorphins? [laughing] That was a cool surprise. When you train for a marathon, you top out around 20 miles. So I thought after 20 miles, a whole different race would start, mentally. I remember reaching a point where I was ready to be done, but I didn’t have to harness my everything to get it done. It was smooth sailing. Is there anything about running you find challenging? What becomes difficult for me is my actual body not my fuel. Most people have difficulty with both of those things, I often feel I can always keep going. I had hip surgery two years ago, and I was unaware of it at the time but it made all three marathons challenging. After the race, my hips would be destroyed for a whole week. I used to think that was just normal. It felt like my calf was about to Charlie Horse. I’ve logged enough miles with it so I know it’s not going to happen but it became this mental mind game. I had to convince myself that it was not going to happen and to keep running. What was it like running the RunMagMile? The weather was perfect. Seventy-three and overcast. It was spitting rain, which was great—not enough to slow me down or mess with my visibility. Just enough to keep cool. It was a small race, only 1,400 people. There weren’t a lot of spectators, which is fine. I can handle thirteen miles without spectators. The run was smooth although the path was a little dodgy. South on the Lakefront, those trails tend to peak in the middle. Around mile 9, I was running on a slight sideways incline and could tell my ankles were getting taxed. The race thinned out towards the end. Coming up Columbus, the last 200 meters was a long straightaway. There was so much space between runners that it was just me in the last 200 meters, which was so cool. When I crossed, everyone was cheering and it felt like I was the first person to cross the finish line. I came in 115th place, which isn’t great but I came in strong. What was your first thought when you crossed the finish line? How were you feeling at the starting line? I was feeling super emotional. I was nervous, had butterflies in my stomach, and wanted everything to go well. You’d think I was running the Olympics. The national anthem even got me choked up. It was the effervescence of it all. Do those nerves fade away? Did you have a goal for this race? I wanted to keep it below 8 minutes a mile. I’ve been working on running 180 strides per minute and wanted to maintain that the entire race, which I was able to do! I used to count 15 steps with one leg every 10 seconds, now I have a playlist of songs that are 180 beats per minute. It kind of feels like dancing when a good song comes on. The endorphins! Once your 8 to 15 minutes in, your kinks are warmed up and you finally hit stride. You got a nice pace, comfortably settled in, and there’s a freedom that comes along with it. I’m super appreciative that I have a body that lets me do this. Even though it’s hard, I’m grateful I can get out there and do it. I don’t think about a lot. I get kind of a blank screen when I run, which is what I enjoy about it. I’m Zen. I also don’t ease up on myself. I have friends that run marathons for fun and that’s awesome—there’s a luxury to that. I always want to do better. You put in months of training before a race and it seems like such a bummer to not see what all that training can do for you. Do you ever get tempted to walk or slow down? Do you use running as an opportunity for reflection or to work through problems? I don’t work through problems when I run, but I feel better about them when I’m done. I don’t drink through problems, I run through them. Aside from the dodgy path, were there any other challenges you had to overcome? There were a couple of guys on the path that were crowding me out. They didn’t want me to pass them. This happens a lot. He finally moved. People who do those things don’t like confrontation, they want you to shrink back. Once he got out of the way, I put the pedal to the metal and moved around him, politely. What would you say is the biggest difference between a full marathon and a half? I can have pace goals [in a half marathon]. The marathon is a crap shoot. I can say I want to run a certain speed but 26 miles is a long time to keep pace. At the end of the race [RunMagMile], I had a lot of fuel left in the last 2 miles and bumped up my pace. In a full marathon, that’s never an option for me. After 20 miles, you don’t have a lot to bare down and figure out. I would have had zero sprinting power to move around that guy without knowing I was going to pay for it later. Whereas running 13, I can make shifts and use my body in a different way. Do you get the same level of satisfaction and achievement running a half as you do in a full? I was happy with the half. I proved to myself that I could run again. It felt like something I had more control over. It’s been 4 years since I’ve run a marathon. I could see myself being happy sticking to halves and seeing how well I can do. My new goal is to shave a minute off every mile and qualify as an elite runner. Why do you want to qualify as an elite? When I was in the corral I saw all the elites come in late and they looked so cool! They’re like the cool kids and I want to sit at their lunch table. I don’t care if I’m the slowest one, just get me there! [laughing] Time slowed down and their hair flowed in the wind. Got it. How do you qualify? I’m still trying to figure that out. From what I can tell you have to be able to run one thirty or faster. That’s 12 minutes and 42 seconds faster than what I ran. My plan is to put in a ton of strength training over the winter to get ready for the spring and summer racing season. I’m so pleased that all this hip stuff is going well and I want to see what I can do. Running Boston use to be something I cared about, but it doesn’t matter anymore. I just want to be fast. I don’t care where I’m doing it, I just want to be fast. Stick one foot in front of the other. Each step you take doesn’t have to be the last, keep going. This also happens to be my life mantra. Everything always works out in the end and you’ll get to 13 miles even if you have to walk. Nobody wakes up and runs 13 miles, there’s a lot of work and repetition that goes into it like anything you master. Just go! 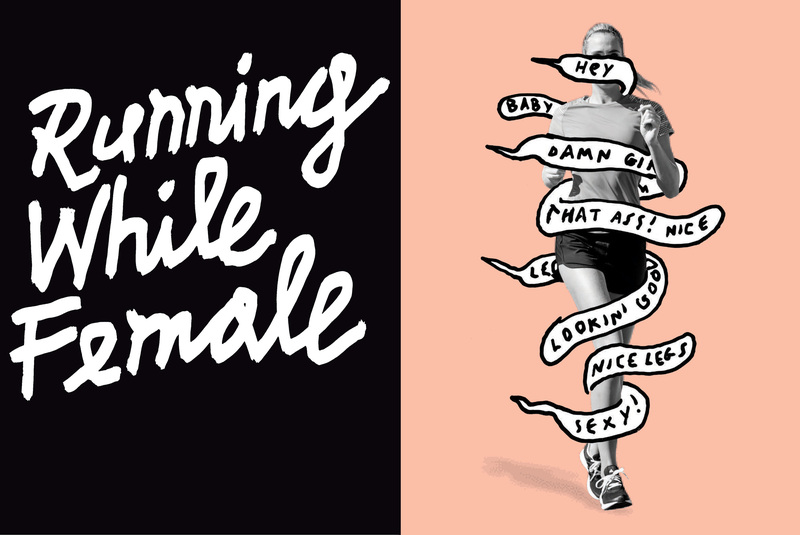 There’s a great article that showed up in Runner’s World called, “Running while Female.” It talks about how often women experience sexual harassment when running. It’s not quite the same thing I was talking about earlier, but worth reading. I think I had a vanilla one at one point; that was not great. I run in Mazunos and train in Nike. Best costume you’ve seen at a race? I’m usually in the zone and don’t pay attention to what’s going on around me. Sometimes you see newlyweds running as bride and groom.